The Lincoln School Pageant was held at the Petaluma Elks Lodge, with school children from one of the last remaining one-room schoolhouses in Northern California performing “A Yankee Doodle Dandy Christmas” and presenting American flags to the veterans in the room. 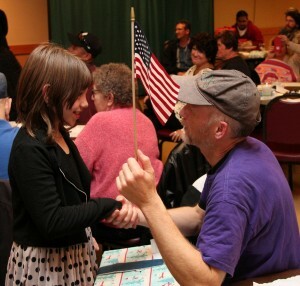 Above, Isabelle Brenner presents a flag to Joseph Joe at the Dec. 15 event. It’s been a while since this took place but it’s a sweet enough picture that I couldn’t resist.